Dealing with a SASS member is not usually a problem, it is dealing with someone from the outside that you need to be careful about. Be careful with posting your email address when you are looking for something to buy. There are people out there that surf these forums looking for someone that puts there email address in an add. They will then surf the web looking for a picture of the item you are looking for and send it to you making believe that they have it for sale. They will make a deal with you for the item you are looking for and once they have you money they disappear into the sunset. If you are contacted by someone saying they have the item you are looking for ask them to send a picture of it on top of a recent edition of there local news paper just to prove they actually have the item. Best to request that they PM you or post on the thread this way you have a better chance to know who is responding. I got taken once and on another occasion I asked for the picture and they never responded to me. Just don’t want you to suffer the same fate as me. I have been making Black Powder blanks for reenacting on my Dillon 650 for more than 10 years and I use the Dillon powder dispenser. Never had a problem with static. I have both the spent primer catcher that replaces the slide in box catcher and the unused primer catcher that replaces the ski jump. I like them both and both work great. If I were you I would buy the loading gear that I need for the caliber I am presently shooting. This will save you money on ammo and possibly enough in the long run to buy the 45 loading dies and one or more 45 pistiols. If is was something people liked a lot you would still see it done on a regular basis. The fact that it is rarely done anymore should tell you something. Can you tell us more about the court cases you quoted? Got your email and will send you the white one. Thanks for the feedback. The idea of the white one is to simulate the stone that was used for making temple buildings. But most of the furnishings in a lodge room are stained wood with a clear coating. I have been making and selling the ones with the stained wood finish for a few years now and I just figured I would solicit some opinions on the white finish experiment. 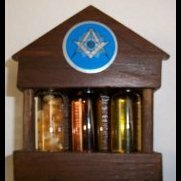 This is a little off topic but I need the opinion of some fellow Masons. 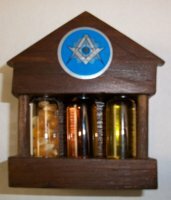 I make and sell little wooden temples containing Corn, Wine and Oil for the Fellowcraft degree. I have two versions of it and I would like to get the opinion from you as to which one is better. Both are made of wood. One is stained and varnished and the other is painted white. I have attached a picture of them both. Please let me know which one you would choose if you had to lay out $18 for one. I will take the 3x heavy tan duster. My email is t.schultz5@roadrunner.com I can do paypal if it is good for you. Roy The law on 10 rounds in a lever gun is pretty clear. But the reality is that no one is lurking around cowboy shoot to see if you can load 10 or 12 in your lever gun. Also police would only charge you with this law if you did something else and they were looking to pile on extra charges to put against you. That's good to hear. I guess the information I received was wrong. The only thing I will say is that sometimes the State Police have been known to give several different answers to the same question. I could be wrong about this but I think I remember reading somewhere that just after the Civil War started the Congress passed a law that made it illegal for states to secede from the Union. The western part of NY is also making noises about splitting away from the rest of NY especially trying to get away from NY City.